Has an art teacher or well-meaning friend ever told you to ‘loosen up’ your painting style? Was it a suggestion you wanted to hear or did it undermine you? I was speaking with a 30 yr old guy the other day who, on finding out I was an artist, told me his own personal history with art. It was very familiar and one I’ve heard countless times from students at workshops in the UK and USA. He told me that he’d LOVED art as a child and had had a talent for it. He had spent hours drawing and painting and had developed his skills so that he was good at accurately portraying his subjects. But when he was 13 he got an art teacher at his school who was frustrated by his detailed style and insisted that he ‘‘LOOSEN UP’. His style was frowned upon as inferior. He battled with this teacher for the next couple of years but became completely disheartened with art as he was so discouraged from drawing and painting in the way he enjoyed. He gave art up at school as soon as he could. He hasn’t painted since. How sad is that! The fact is we are all different in this world. Some of us get a kick out of making art that looks ‘real’. It makes our hearts sing. The process, as much as the result, brings us enjoyment. It allows us to engage with our subject on a deep level. We REALLY get to perceive every bit of it by looking at the details. We get to KNOW it. That’s just what happened for me with this red Banksia (above). Painting it in this level of detail gave me a really deep appreciation of it, and achieving its 3D form was enormous fun. As it stands, here in Europe and the USA, the received wisdom is that ‘tight’ (the often pejorative term for ‘detailed’) painting is inferior to ‘loose’ more impressionistic painting. But I think that’s plain wrong. Students at art school are taught to loosen up, then some go on to teach students in school to loosen up. But in the end, if you enjoy painting, no matter what the style, no one should tell you to change. And if they do, they should really loosen up! If you have a story like this please share it in the comments below, I’d love to hear it! Hello Anna! I’m glad I found your website. I want to thank you not only for all the wonderful resources that you have put together, but also for this particular post. I can definitely relate to this story. Although I want to achieve a loose painting style, I also want to learn creating realistic and detailed paintings. However, I want to do it for myself, and not because I feel pressured to change my style for others. I love your, and other works by different artists that are really detailed. It is true that it really helps a person to get to know your subject when you study it so closely and work on all of those details. It is as if there are whole little worlds inside a bloom of a flower. I have been painting for many years with different mediums. I used to paint loose without much detail. When I found this website I loved it! I found with art your always changing and growing there is no limit to where you go! No boundaries! I can really relate to this post, Anna. FIrst, lovely painting! Your ability to notice the finest details and bring them to life is what I love about your work. Because I am self-taught, I developed my own way of painting and drawing because I followed my instincts and my desires to depict what I saw in my mind, and in my heart when looking at my subjects. Each subject is different. Some of my paintings and drawings are not as detailed as others. But so many times people have said to me…you should do more of the looser, more expressive paintings! Or, “Eventually you will learn to be looser and more expressive.” To me, this is a very ignorant thing to say to any artist. Hi Anna and all. I am so relieved to find your site and have signed up for your classes. This particular subject has driven me nuts for years. I went to art school late in life (my late 40s, graduating in my early 50s). I begged and pleaded with my teachers to teach me how to paint, but they wholehearted refused. They were not going to “give me a recipe” to paint, because I would then paint just like they did and I should paint in my style. I should loosen up and not worry about knowing how to paint a tree that looks like a tree and just play with the paint. Soon, their eyes began to glaze over whenever I brought up the subject. They would give me a place to paint and number of paintings to have finished by the end of term and that was it. That’s not teaching!!! Grrr!!! I feel like this whole loosen up stuff came from when the modern painters broke away from the French salons because they were so tired of painting in the old style (detailed, representational). Yes, that was a great change in the fashion of painting, but why should I be shackled by what’s in fashion? I want to paint the way I want to paint! So, I’m so pleased to have found you, Anna, and your classes. Thank you for FINALLY giving me the okay to paint the way I want to paint and to teach me how to do it. You have no idea what a relief that is. I think art teachers mistake “tight” painting for “stiff” painting. I’ve been looking at some 18th and 19th century paintings lately, and the one thing that stands out from all but the masters is that they look unrealistic and a bit cartoony. They are focused on accurately portraying the roundness of the human or animal form, but don’t show true observation of the subject’s details and the rhythm of its posture. Artists today are very focused on getting an accurate depiction of a realistic human form…but for some reason art teachers can see the value in that, but not the value in doing the same for other subjects. As a person who finds the popular style of wet-in-wet, vaguely impressionist watercolors a bit silly, I am grateful to Anna for finding and teaching a way of painting that respects the subject, while eliminating the ego of the artist as a self-conscious interpreter of that form. There is no better way to study and share your knowledge of the subject than an accurate rendering. And there’s nothing more beautiful than celebrating nature in all its true beauty. RE: “As a person who finds the popular style of wet-in-wet, vaguely impressionistic watercolors a bit silly…” Can’t we have both and all? Why would this style be any more silly than a realistic style? If there were one best way to do art, Chagall, Rembrandt, Van Gogh, Bierstadt, Picasso, and Klee would all have painted the same way. Thanks for the reminders. I recall being in first grade practicing lettering, and making small sketches, while waiting for the teacher to show up to help me. This enraged her. In the end I was told that I had limited mental capacity and that I would struggle in school. Several years later one of the schools had a free art/drawing class. I was one of the youngest. I found it boring and non-informative; which didn’t help when the teacher would often miss her own class. However, the one up was that I learned that applying different pressure to your pencil would make a difference in how flat your sketch would be perceived. Several other stories I could share, none (not even these) having entered really into my mind until reading this, and watching a couple of your blog clips. No wonder there is subconscious hidden agendas against myself in this area, obviously not limited to auto accident recovery in which I am currently in. Guess they popped up in the archives of my mind while trying to get my life back together from my accident, all trying to haunt me to a halt. Guess I need to prove my archives wrong! I will relearn how to paint and draw again. Taking a lesson even from myself, that although someone told me I wouldn’t be successful, and seriously struggle like I couldn’t make it in school, that with grit and GOD I was nearly a straight A student, so much so that commonly dubbed the teachers pet. It became usually not a struggle to do, but often boring because it wasn’t challenging enough for my creative mind. By God’s grace and power I will move forward!!! Not necessary to be something awesome to others, but to give the right details in my life to bring joy and contentment in the human-being, and for it to someday be a blessing to others. There is a destination….the necessary details are in choosing the right path. No halting but a GO forward, whether in little steps or big ones. Or is that no matter how large or tiny the brush stroke. Each stroke is of highest value. Thanks Anna for the reminders & encouragement! I love painting very realistic , lifelike paintings, yet I am constantly being told to loosen up & make bigger more expansive strokes. I love the way you build up layers in watercolour & have at last found a way of painting that I love , thank you.! It has been so dispiriting to constantly be made to feel as if my work is wrong & despite going to art classes for years after I retired, I never felt I was achieving anything I liked, & my work was usless ..If I asked how to paint watercolour techniques, I was told painting can “not Be taught” & made to feel that I was wasting my time. I am now spending many pleasurable hours painting flowers, birds & animals your way & am very happy & enjoying my hobby very much. 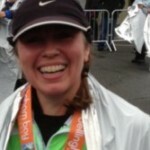 Thanks to Anna for all the tips & Courses. Kathy. My first art weekend was with an artist who paints loose and asked us to represent and interpret. I myself land somewhere in the middle now. I will attempt to work in both styles because both are feeding something different. Sometimes I just want to dab wet on wet just to watch the flow and mingling paint action and add a few details and other times I want more detail:) I love the realism/nature and simplicity of background which is what prompted me to enrol in Anna’s online class. I’m starting my 3rd month:) I’m starting the mouse this weekend! I just love it!!! love that from the art guest Lammi – that’s really helpful. I may share that one. I think many loose painters are not able to paint in detail. I have found that once you passionately embrace doing what you love most, you will find and audience for your work. People recognize the passion and are drawn to it, and while not everybody might hang it on their walls, you’ll find yourself in enough of a niche to find the ones who do. Anna, thank you for this article. I loved art when I was younger and did work with colored chalk in grade school. WhenI got to high school I was told that I was too detailed and gave up. Throughout the years, I did other activities and missed painting. I retired and had time to learn to paint with watercolors, however, I was told that I needed to loosen up and not be so detailed. I was discouraged once again. Then I joined your school and found out that it was okay to paint your own way. Thank you for all the info you share with us. You hit the nail on the head when you asserted that dogmatic advocates of loose style need to loosen up. Brilliant! I have really enjoyed reading these comments . I first started painting at 80 years of age . I was handed brushes canvas & paints by my friend who paints in the Life Style village where I came to live after a busy life of breeding showing & judging dogs . My husband ‘s health was declining & he needed more of my time so I gave away my beloved dogs .& I asked my friend to show me how to start painting as I needed a hobby. Much to my joy & delight I found I had a small talent & I discovered how I could slip into my space & all my worries would fade as I lost myself painting in acrylics. I then decided to try doing animal portraits in pastel . I soon had painted all the dogs & cats present & past on for every one that lives here..When word got out amongst the Dog world people that I painted life like pictures of Collies & Shelties I started to get orders from owners wanting to buy from me . All this was good for my ego but I wanted to do other subjects . I thought I should have some training & found a teacher locally & joined a class to learn watercolour.My fellow classmates are so special that after five years I am still struggling to find satisfaction with my results . I have a cupboard full of expensive paints & other equipment but not happy with results from painting in a loose style . Anna’s pictures of flowers made me long to paint like her . So I have now started another journey . I hope I can be successful now I have found this wonderful site I will be trying . Thank you for this post! I love painting details. I get so much enjoyment out of it and it calms me down. I was getting very discouraged and frustrated by the pressure to paint loosely, People are not trying to be rude, but they don’t understand the damage they are potentially doing to the person who is struggling to be their own authentic self.. They really just don’t understand the tighter painter’s mind set. Saying ‘paint loosely’ was like my first grade teacher who tried to make me write with my right hand instead of my left–impossible for me. I began painting and drawing at a young age. I began taking painting classes again a few years ago and almost quit class several times, but I was determined to NOT quit painting. Class was becoming miserable. I finally just continued painting the way I wanted to paint but used the other great techniques being taught in class. I just ignore all the comments about my painting style now. Yes, I have been told I need to loosen up. I am so glad to have found your site. Your work is amazing. I love to be able to paint detail! This I have learned from you. Paintings look like you can just reach in and pick them up! I also like to painting loose when the occasion calls for it, usually if it’s an abstract and something that is not real to begin with but the painting looks nothing like my detail painting. Like you said..it’s your style so I say to each his own. Let people paint in the style the prefer so they can b there own. Thank you Anna, that’s so nice to hear after being told so many times that realistic painting just isn’t real art/painting. Thank you Anna for saying this! I was told many times that I need to loosen up and it felt like criticism. Try as I might I feel a compulsion to paint details ! Perhaps my eyes see more than others! That’s why I love your style ! The paintings look alive instead of blurred! I have felt the same Amita – when people say this it is as though they think your work is not good enough. 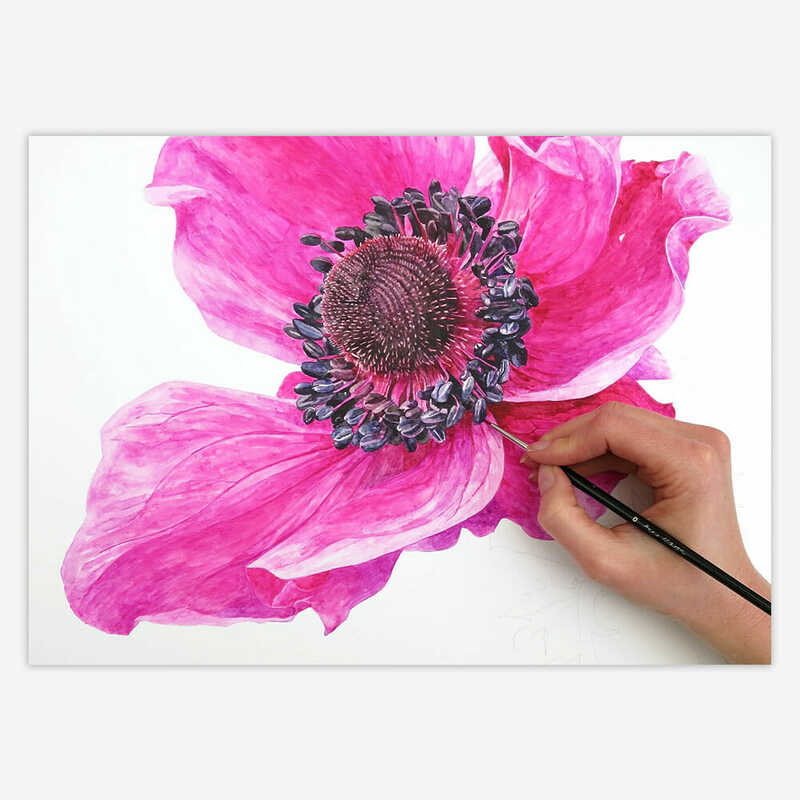 I think that most botanical artists and illustrators love detail, and strive to make their work realistic, and put in as much detail as they can, otherwise it is just “flower painting”, and not informative..
You are so right though, art is about expressing yourself. It would be awful if we all aimed to paint in the same style. I’m art trained and feel that since joining Anna’s art classes and her perspective on attaining a clear way of a representative to produce an image . It has helped my Art! It doesn’t matter how loose or how tentative my representative is of my perseption of my work is it is RIGHT! So you please keep going because loose, tight or somewhere in between it WORKS. Many thanks Anna. Your works great and so are many others. Just let’s learn and accept each other. Just keep painting and enjoying it. Hi Anna. I am glad you posted this. I’ve always thought I should “loosen up”. I have all intentions to try to do it but I end up producing a very detailed painting. Now that you have confirmed that I really don’t have to…. I won’t try so hard. It actually stopped me from painting because every time I tried…. I would fail. I’m going to be myself and paint my way. Thank you! So glad to help you give yourself that permission Elizabeth! During the first half hour of my first (and only) watercolor class the instructor made a smirky comment to the other students while pointing to me “looks like we’ve got a perfectionist” on our hands”. I was embarrassed and felt judged and ashamed for my love for detail. 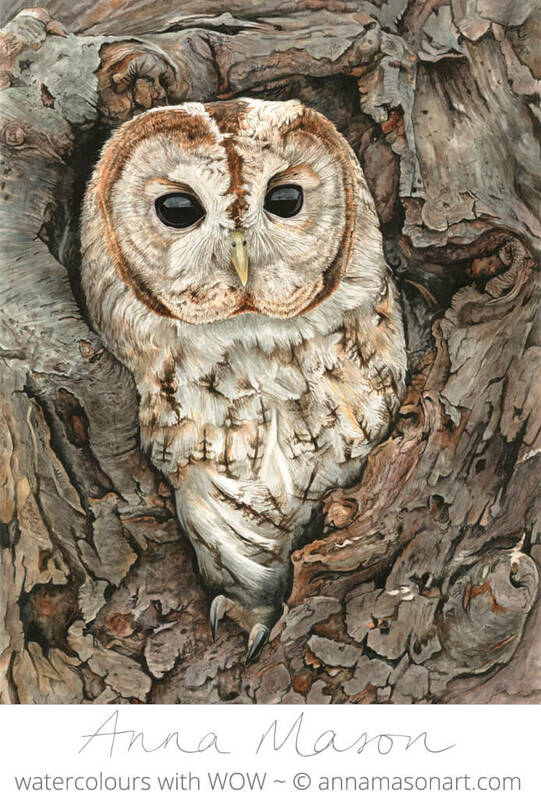 I kept painting though and have sold several of my photorealistic watercolor paintings! I love painting and drawing detail too and I’ve definitely been told to loosen up. Luckily, I’m stubborn AF and ignore such pedestrian advice. Maybe it’s also because when I’m not painting fussy little details, I can be found with big brushes and rollers painting interior walls! I teach what « gesture » is and then I use that term when I teach. I think it is helpful. There is no “should” in art and artistic expression. Except, you should do what pleases you! Yin Yang. It takes all styles to make the whole world of art. I personally think of doing tight detail as meditative. 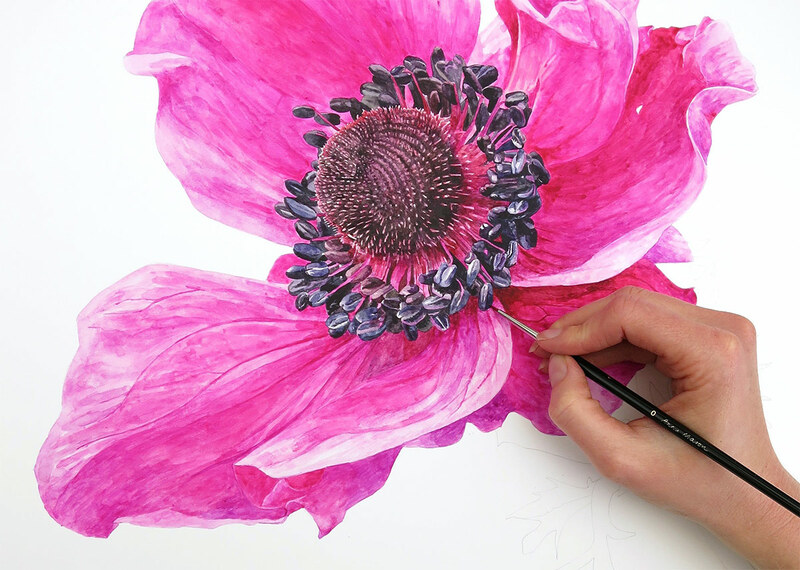 I find relaxation and peace in creating the great detail of my botanic illustrations. That is what “loosens me up.” When I do expressive, abstract or emotional art I find myself exhausted at the end. Then I need to do the calming detail work to recharge. Great way of putting it, I’m sure lots of us relate to that Mary! Creating a detailed drawing and/or painting, that is well-executed and crafted with devotion is a form of meditation which is in itself an art form. 100% agree Rita, thanks for the comment. Anna, you are right on point with this one, and I do not think your frustration has anything to do with your pregnancy 🙂 (I”m coming over from your mailing list post). It is definitely a valid point and has frustrated me quite often and deeply. I used to take it so personally that I felt guilty for not being able to paint in the “loose” style. They made is seem as though you’d be “over doing it” or even wasting precious time if you did not elect to paint quickly. It actually made me feel really dumb because it seemed as though they were accomplishing so much more in far less time, but I prefer the slower-paced detailed paintings. I must also say that I came across an artist who painted loosely and expressively but with slow precision. After seeing that, I began to accept that I can moderate the process for myself and place less emphasis on others’ preferences because their preference should not dictate my style of painting or level of enjoyment. Thank you for this post and the email because it helps me feel less alone, and I think it confirms that I can continue to paint and develop my own style at my own pace. You stick to what you feel comfortable with and enjoy Annette, that’s the key! I try not to use « loosen up. » I teach my art students what « gesture » is and then I use that to get my point across. Critiques for teens can be tricky though. Acknowledging their growth while encouraging more growth can be tricky sometimes. Hi Anna! First, all the best with your second bundle of joy! Yes, I’ve been told loosen up many times! Also, why do you do such realistic drawings and paintings, or just take a picture!!! Love that one! I have been told many times to loosen up. I love to paint detail so, NO, I will not loosen up! I remember when I was in art school many years ago, studying drawing the human figure. Which is wonderful to do unless you have 3 different instructors with 3 very different approaches to figure drawing. As the semester went by I found myself trying to draw in a very loose style, then a more controlled style, which led to a more cylindrical style. I was no longer drawing my own style. Loosen up, tighten up. This became a real frustration. After the classes were over, I was so discouraged to use my own style. Many years have passed, When I pick up my pencil or brush, I still feel as if these instructors are watching. I love my detail, tight or not. I love your teaching style Anna. Thank you for sharing your talent. This really strikes me to the core. I am a children’s illustrator, but I used to be a graphic novelist, and through it all, I have struggled in two industries that tend to prefer loose expressionism over detailed realism. I would call my style detailed expressionism, and it means I get criticism from both ends! Not expressive enough. Not realistic enough. Yet the people who love my work always tell me how much they love the detail as well as the expressiveness. I have explored both ends of the spectrum, and it’s definitely somewhere in the middle where I am happiest, but it’s taken years to feel confident in that assessment and to stick to it, to not feel like I “should” be doing this or that. Art is a form of expression, be it hyper realistic or vague impressionistic. So while I recognize the demands of one’s industry can often drive a need to adopt a particular style, I find that embracing our artistic idiosyncrasies is also what makes us stand out. Don’t get too loose and don’t get too tight either. Just do what makes you happy and gives you joy. Agree entirely, our art group have recently had a lesson from a local artist who used to teach at Manchester University. His attitude was – if you don’t paint like me you are wrong – even down to what brush to use, recommended some big floppy thing that holds loads of water; absolutely useless for my preferred style of painting but pretty good for splashing paint about..
My attitude is, do what you like and enjoy it, very happy to watch others and if there is anything that suits me or I can adapt to my style I will otherwise leave me alone. The irony here is that I was reading a comment the other day on an artist’s video that said she should paint more realistic. She used to, but her style has evolved into something magical that she thoroughly enjoys. You can physically see the wonder and happiness and surprises being expressed as she paints. So as the expression goes, “you do you.” Let no one take away your joy. As my fellow students and I were struggling to oil paint a still life of a set of wine bottles, our teacher paced around us saying things like . . . “Be expressive. If you want it to look real, go take a photography course.” I gave up on that teacher (and oil painting) but tried colored pencils and then your water color classes. I’m glad I did, because it turns out details make me very happy! Thanks Jean – for both your comments and for sticking to your guns! Stick to your guns Lana and congratulations on being recognised with awards!! Really appreciated this article. I took watercolor lessons from an artist who was a lot more detailed at the time but had since turned to a very loose artist. I appreciated her more detailed work. It is so true, we are all different and trying to emulate exactly how another artist sees their world may not be what is right for us/me. I just couldn’t get myself to like or really get into that loose style of painting. I fell in love with your work the moment I saw it. I love the detail, the reality of the subject. So, my work now falls somewhere in between; not really loose but as detailed as I want to be. Makes me happier and more relaxed to be”me” in my art. Thanks for this article. Happy last days of your pregnancy. All the best! Anna, you’re so right – hormones or not. We all move at our own pace. And CONGRATULATIONS. Didn’t know you are expecting your second blessed bundle. Hope all goes well. Oh yes…heard to loosen up many times. A bit of HUMOR….I told them that my husband really didn’t want a loose woman !!!! Oh theit expressions……paint what you see..what you love and try to perfect it along the way. Your baby will be lovely I’m sure…….thanks for you help….. It seems that detailed artists are somehow looked down on by the art establishment, certainly in the UK. One only has to look at open art competitions to see the bias towards loose painting in the award of the prizes. However, that is not true of the general public many of whom very much appreciate the skill, time and effort put in by the artist.. I have just shown some of my work in a prestigious exhibition where all the prize winners were, shall we say ‘loose’. However the people’s choice award went to myself for a detailed still life painting, so all is not lost! Unfortunately this dogmatic bias has been allowed to dominate schools and colleges for decades. Even on TV art shows in the UK we hear art critics, instructors and judges talk down detailed painting as if it is something to be avoided at all cost. I find comfort though knowing that when I walk into an art sale or exhibition 90% of the paintings will be ‘loose’ and tend to all look the same when grouped together. Highly detailed paintings thus stand out more to the viewers and probably stand a better chance of a sale. As you say, we paint because we enjoy it and should be free to express ourselves any way we like. One thing I am certain of is that there is no right or wrong way to paint – a point which should be borne in mind by the art establishment. My advice to all artists is to challenge anyone who tries to tell you what is right or wrong in art – they usually back off unable to formulate an argument to support their words. Great comment Roger and congratulations on your sales. I agree that in my experience the wider public are far free-er about responding to what they genuinely like in a painting and a lot of the time that will be styles that are more realistic. I’ve found it myself where people really enjoy seeing a painting look really ‘real’ and yet be painted. It certainly makes them appreciate the subject much more than if they just saw a photo of the same thing. Love your rant Anna, your paintings are beautiful and your teaching style is inspiring and brings pleasure to many people. Painting is a very personal thing and whilst I love and try many different styles of painting, I don’t think anyone should tell you how or how not to paint. You should be encouraged to enjoy art and try various styles and mediums and hopefully you will find the one that suits you. I enjoy painting realistic pictures, I find them a real challenge as well as totally absorbing. I’ve had comments like ‘ why don’t you just take a photo’ . I’ve found that sort of criticism unhelpful and unnecessary and initially upsetting. I now ignore any negative comments and paint how and what makes me happy. I’ve been told to “loosen up” so many times! I wish people knew how that comment is a sure way to lose my attention and care for their opinion. Most of the time it has come from people who see me striving to create something and feel uncomfortable watching another person struggle. It comes from sincere caring, I’m sure. But to me it’s like telling a surgeon to “loosen up”… I’m not doing Modern Dance, I’m trying to get a particular result! I’m self-taught. I finally broke down and took a class. The first assignment was to do a watercolor and bring it into class for a critique. Her exact words to me were: “So you want to be an illustrator instead of a watercolorist eh?”. After I spent hours glazing, adding details and yes, controlling my lights and darks. I still work that way and find the very, very loose style is better left to those who don’t want to paint details. I use gesture painting in my backgrounds but get tighter with my focal subject. For me (everyone’s mileage may vary) “loose” means my painting looks messy and it never ever turns out the way I want it to end up. So, I prefer to paint the way I paint because that’s what makes me happy! I love loose paintings by others, but that style of painting is not for me in my own work. I have been told to be more “painterly” as a synonym for loose. When I feel the need to loosen up after too much time being realistic, I do “Zentangle-style” pictures. These are still very controlled but not realistic. Fun! I stopped going to an art class after the 1st class for this very reason. That was all they were telling us to do. No technique, no theory, just “be loose.” Ahhhhhhhh. You just won a very special place in my heart for this rant! I love painting and drawing detail. Getting lost in the process for hours is what pulls me back again and again to do new images and is so satisfying. Your work is amazing and inspiring Anna, I have admired it for many years since I found your web site and have also seen your pictures at various exhibitions too, they are even more incredible in the flesh. Well said, each to their own style, take care of yourself. I see the detail, find detail fascinating and would love to incorporate more into my notloose style. BeforeI became an art teacher, I spent nearly 30 years in elementary education, I learn from my teachers to emphasize the positive. Maybe, a I wonder if—-? One university instructor suggested a few beers to loosen my style. I enjoy my art for me and want to grow and in my art. I had a lovely watercolor teacher who told me just that – that I needed to loosen up and not be rigid. That worked for her. Well 20 years later I have time to paint, and I immediately was drawn to botanicals. I then realized what I had been seeking before. Thanks! My experience at an art class was awful! I went wanting to learn to do realistic drawing the adminstrator told me yes we can do that so i paid my £400 . I wasn’t told the course had already started so i paid for 2 classes i had missed! When i spoke to the art tutor about realistic drawing his eyes rolled up he sighed and said stick to drawing cartoons! I never even lifted a pencil at this point! I stayed for the water colour lesson which was a mono painting -a mountain some grasses and a full moon , i remember doing this at primary school. So i wasted £400 . The administrator was so angry with the art tutor she started to encourage me as i decided to teach myself. She really did boost my confidence . So much that the american artist jdhillberry has asked for and seen some of my drawings and he surprised me by telling me i had talent and that i could use his work to advance myself . He is such a pleasant man and very helpful. Now, i want to do detailed painting. I am getting better in acrylic but not water colour so much!! What i have learned is art tutors tend to say things like ‘loosen up’ when they don’t know or can’t do what you are doing! Wow, you hit the nail on the head! You are on fire Anna! I think it’s really bothered me to hear people say that. It’s like my art has to be abstract or impressionistic to be considered good by “real artists”. And it seems that impressionism is the more “accepted” art form in galleries. And I’ve had enough of that mindset. I appreciate impressionism and think it’s beautiful, but all of it isn’t. I want to be able to understand what someone has just painted. I prefer realism, like impressionism, and not so much abstract. But I’m not ready to give up realism just because someone tells me it’s not the right way to do it. I think a good artist that does realism well can hold their own when it comes to selling their art. When I was little, I would draw anything and everything. In school I had a few teachers who loved my drawings, but I had many more who thought I was just making a ‘mess’ of my workbooks. When I was 8 I received a set of pencil crayons for my birthday and I was so excited to use them! I doodled in my workbook. The teacher gave me the strap for the ‘mess’ I’d made. Obviously this was many years ago, but it’s something I’ve never forgotten. In later years, my teachers were quick to point out that my art was too detailed, and that I should lighten up and just let go. (The opposite of my early schooling!) I found it infuriating as most of these teachers couldn’t draw a stick man! Now I please myself and I’m still a stickler for detail! Yes, I was once told to “loosen up”! The art teacher actually admired the paper towel where I had been wiping my watercolor brush and said nothing of the realistic painting I was laboring over of a colorful tropical plant!! I only aspire to paint more like you! I’m getting better and proud that I take more time with the realism. Take care of yourself and that precious new little baby! I too love to draw detail in graphite and coloured pencil and it is definitely not a loose style. It is slow and very meticulous and I can get completely lost in my drawing. I love getting up close and personal with a plant and that requires lots of close observation that does not lend itself to a loose style for me anyway. Thanks for a well written article. I have friends who paint in many different mediums and we all enjoy to see who does what and how we do it. I have tried to paint “loose” and its just not my style. I started out with watercolors and am now learning to paint with oils…but it won’t be loose with me. .Any kind of painting should be a joy, no matter how you do it. I am so glad someone said this. I’ve only been painting about a year as a graphite artist attention to detail is always good and I translated that to watercolor because it’s what I know. And that is why I love the Ana Mason videos I find on YouTube. If I could afford your classes I would definitely take them. But the tips you give online are very helpful to someone like me. I’ve asked people what is a loose style of watercolor because to me it simply looks like it’s messy and I can’t do messy LOL. I don’t think there’s anything wrong would doing a loose style if it’s what you like and you enjoy doing you should paint however you want to. But it’s annoying when people get mad at me online or in person because they don’t believe what I do is watercolors or as I was told in the beginning I’m doing it wrong. Anna Mason was my first lesson and why you should do it wrong. My Art teacher has been trying to persuade me to loosen up for a couple of years now and I have tried – very hard- but when it came down to it, what I love is painting the detail, not necessarily every tiny bit, but enough for the flower/ bird etc to be recognisable and alive looking. I have poor eyesight, and painting is the only time when I really get to see something clearly, and I want to “record” it in as much detail as possible. That is why I have always been drawn to a “tighter” style. Most of my friends love my painting, but when I show it to my professional artist friends, they all say I should go loose. But I don’t want to! Their comments discouraged me a lot, until I decided that I would do what I like. My forté is in animal portraits, and I love to use watercolour to show the texture and the shape of my subjects. When my brush hit the paper, I can almost feel the curves and the underlying bone structures of the animals I draw. When I stumbled upon your website, and saw how you are also pursuing that 3-D effect and textural details with your botanical paintings (and more), I feel so relieved that one can be successful without “being loose”. It is almost like finding a kindred spirit among a sea of strangers. There are great examples of “loose” watercolours out there, but it doesn’t mean there cannnot be another style. Watercolour can be versatile and it does not have to be translucent washes. Thank you for reaffirming that it is ok to use watercolours to capture fine details. Love your article, I have been in classes for about 8-10 years and have always been told to loosen up. I have struggled with this for so long I think my mentor is finally getting tired of telling me to loosen up. Love your site and style of painting. Yes indeed, I like to explore lots of different styles of painting, so to be told to ‘loosen up’, is disrespecting my choice of style. I now attend a class that is less judgmental and more supportive. Thanks for the opportunity to have a say!!!!!!!!!!!! LOL. Hi Anna I feel so inspired when I see your beautiful paintings .The colour & perfection such a joy , I can’t wait to try out . I now ignore being asked to ‘ loosen up ‘ as it gives no pleasure in the end result . Agh…. ,the times I hear that.I love detail and have no intention of becoming looser in my painting. You are so right! I’ve had numerous teachers try and stress that I need to loosen up! I hate it even more judges are just as strict! I started second guessing my work and then painting wasn’t as enjoyable to me because of not fitting in. I use to think “ I want to paint like David, or I want to paint like Jenny,” Not anymore! Once I gave up the I want to and paint for me! Art became enjoyable again! Thank you for bringing this issue up! Congratulations on the bouncing new artist,( or fireman, waitress, lawyer) in your family! When I was a senior art major we had weekly group critiques and there was one student in our group that was an extremely abstract painter. When my mountain landscape painting came up he literally tore my work to pieces in a way that was rude and in now way constructive. He was one of these people that felt he was God’s gift to the art world and always tried to be best friends with the professors and no one else. I agree with those that say when someone criticizes those painting with great detail, it is due to a lack of understanding and ability to do so themselves. After the critique session ended one of the professors stopped by my work station and apologized for him and said he was in the wrong and it would be addressed. I didn’t let it get to me because I really didn’t care what he thought. My love for creating art comes from the joy of the process and the therapy and relaxation I get from it. I would be curious to see if he actually made it as an artist. Anna.. You are sooo correct. I was a draftsman (woman) for 15 years.. that’s a very detailed profession.. When I took an art class the first thing the instructor told me was to “LOOSEN UP”….GRRRRRR… 15 years of detail drawing is ingrained on my brain.. Durer was a draftsman and he is also detailed.. These are brain patterns that do not change.. I still paint and draw very detailed and LOVE IT.. THANKS FOR THE VOTE OF CONFIDENCE.. So pleased drawing and painting detail has given you so much pleasure! Love the site & tutorials! Everyone should develop their own style and comfort with painting. Each painting is different and may require different handling, expression and feel. Enjoyment & freedom to express is key, no matter what the medium, style, mood or interest. OH My – what a great email, post. You hit a nerve for me. I have always loved Art and Photography. But as a student and young adult family/parents/people around me discouraged that endeavor. As a newly divorced single parent of two small boys in 1990- I went to school, got a degree which left me in a Paralegal Career. I was good at it, very knowledgable, but hated every minute of it. But had to stay there to raise my sons. In my 40’s, once the boys were young adults. I left that career and tried other careers, did well but never loved it. But Art supplies and Cameras, Photoshop and Adobe Illustrator are magical to me. Flash forward to 2014 – in my early 50’s – I decided to go back to school and focus on a Graphic Design/Visual Communications. Among the required courses, Classes included, Adobe Illustrator, Digital Painting, Several Drawing Classes, 2 Dimensional Design, at least 6 Photography classes and actual paint Painting classes that weren’t digital. I kept being told in the painting and drawing classes to “loosen up.” Over and Over again. It did make me feel like they were trying to tell me I was up-tight. I was told photo realistic was a waste of time, because you could just take a picture and get the same result. Well art that I love to look at is often photo realistic and I know those teachers COULDN’T do photorealistic if they tried. I’ve seen their work and any object they drew or painted look more like an abstract than the actual object/person. I have been a member of your courses, I am not at this time a member- only because I don’t have a foothold yet in a career and just plain old can’t afford to. In the future if possible financially I’d love to resubscribe because your art is amazing! I took these tutorials, because I tried to paint some of my own beloved native forest plants around me, and I was frustrated that I could not do them justice. This online course helped me so much, because I really wanted to be able to paint detailed plants. I really enjoyed how much it made me look at the details of plants in the forest even closer. I agree with the comment about detailed paintings being very meditative, and expressive being more of an exhausting release. I also feel like the detailed paintings capture a depth of color and expression of their own that has a different kind of magic than photo’s. As well, I would much rather know how to paint in detail, then choose to paint looser if I want to. (Than to paint loose because I don’t know how to paint and look at the details. ) I am grateful for this online school, and plan to come back again. Thank you Anna for sharing your knowledge! * I don’t think stopping and slowing down to look at things in detail is uptight at all. I think it is actually the opposite of uptight. Stay well! There is nothing wrong in a good rant to let off steam. There is no just thing as a ‘right’ style…loose or tight. Art is pesonal expression…..plus you need to feel comfortable. If I held the brush by the far end I would simply drop it! Art has and will always be my salvation on earth. I love all artistic styles of painting and drawing; from the loosest gestural flair to the pinpoint realism. Just a few months ago, I came across your website and immediately was drawn into one of your free classes with the green pear. Never have I attempted to paint with such incremental and decisive methods as yours. I followed along with your tutorial and after 2 days, I was rewarded with one of the most realistic and satisfying paintings I have ever done. Upon posting on Facebook, the accolades came pouring in. You teach a method that inspires the well-calculated and organized person in me. My subject matter often dictates to me when and where to use your specialized techniques and I am grateful that you’ve taught me a different approach. Thanks for all your great emails! Yes, I’ve often been criticised for being too detailed! A lot of art these days is slapped on – any old combination of colour will do with no skill in application. I love painting florals and Australian birds and love the details of their little bodies. My paintings always sell, so there are some people who still like a more detailed artwork. I have painted in all mediums all my looong life, 2 yrs. ago I discovered the Academy of Botanical Art and began taking lesson, I unfortunate financially could not continue but then I found you and have both of your books. I love your style!! My answer to those who criticize realism just refer them to the Botanical Antique paintings, which are exquisite, a beautiful art form which is making a resurgence. Good luck to you and the new baby and hopefully Ben will love being the big brother. best wishes for the new arrival, this is the most important part of your life, Life brings life, and joy etc.etc. Deff. by Leo Tolstoy (abt. 1895?) Art is the transfer of an emotion(s) from one person to another via a third medium. Interesting as it covers ballet, food, music, visual etc. The rider to this is that it must be understood (appreciated ) by all people. Not for the elite or specially trained. This means peasant art in all forms is usually the only true art. Dance, music, visual etc and the most artistic movie in the last 100 years would be “Sound of Music” as it is the most popular by all records. From this the truest art is the simple, accurate, peasant art or NAIVE Art that is despised by the critics. It is not the detail but the style that is important. A painting is to capture the essence of the subject, like a perfume, it is to be simple and pure, not muddied and mixed. This is the hardest art because in the hum drum of life it is hard to see the purity of a flower, the joy of the sun rise -set or the act of nurture of a young mother. I suspect modern art,like the music has decided noise is better than tune, Food has passed the Volume over Quality fast (unhealthy) food problem. Hi Anna – your topic stirred up long repressed feelings of anger and disappointment on behalf of my son who excelled at fine detailed pencil work from a young age only to be ‘smashed’ in high school because his work wasn’t loose and in a style the teacher(s) preferred. When you’re young and trying to get decent marks it’s hard to be yourself. I’m lucky to be able to look at two of his works every day that hang in my den but looking at them also brings sadness because he hasn’t drawn since his high school years 20-odd years ago. I’m hoping he’ll pick up his pencils again when his new daughter starts dabbling and maybe rekindle his joy in mark making in whatever style makes him happy. Thank you for exposing us to your amazing art form, Anna. It is a joy to behold. Lots of good wishes coming your way from Oz as you and your family get ready to welcome another bundle of joy. Oh my goodness. “Try loosening up” has been something I’ve heard over the last couple of years while trying to learn watercolor or soft pastel painting, and it’s rather vexing. You are so right; it DID come across as critical, because I prefer aiming for more detail. The way I feel about it, personally, is that learning how to paint with realism may lead me to correctly create more flow-y depictions later, but I do not believe that starting out “loose” will help me to learn to paint in realism later, which is my preferred style. I love how you voice your objections using your hormonal pregnancy moments as a reason for voicing these things. Gotta love it! As I think about it, anyone telling YOU to loosen up…huh? !..has to be jealous of the beautiful work you are creating with careful attention to detail. I’ve learned so much from you. I always feel and say to others that I should “loosen up” but perhaps I don’t need to and should just appreciate my natural style. Thanks for your blessing Anna! I am a beginner watercolorist and have noticed how the loser style seems to be elevated above others. I appreciate that style but for me when I look at it I’m left wanting to see more. Nothing is more satisfying and rewardung to me than when I lay down a brush stroke or color and it comes to life on the paper with dimension and I can appreciate all the beauty of whateverb it is. Peace! Like many, I’ve heard those you-should remarks, from both sides. Life is too short to be bugged down by someone’s unconstructive comments. Heed to what’s helpful and move on. I believe everyone has a special gift from God. And deep down that unique gift is waiting for you to find it, nurture it and share it with others. Like Anna says, we are all different in this world. Enjoy your style! Thank you, Anna, for the reminder and for sharing your exceptional artwork with the world. God bless. I have never been told to loosen up. I do occasionally try to do looser art, but it is not my favorite style. I am more of a middle of the road sort of artist. Most of my art is digital even if it sometimes starts out on paper for surface pattern designs. There is a place for all styles of art. My thought is that those who push a loose art style can’t do the detailed style and are secretly jealous. What I hear more from those that teach surface pattern design is that an artist must find their own style and do just that to be successful. Other than maybe a preference for certain colors, I have no set style and love to try different methods of creating. I I should sit down sometime and try some of your methods; I love your art and the building up with layers of color is something new for watercolors. I am hesitant to start without the materials you recommend, and that I can’t get right now. But maybe I really shouldn’t let that be a hangup. The few paintings that I have done in the past with just a box of children’s watercolors have been OK to turn into digital art. None were finished art anyway and didn’t need to be art that would retain its color for years to come. Hi Kathy, I just used the cheapest watercolors from Michaels when I took the classes, and they still worked well. I also used Anna’s method using rebelle 3 on my touch laptop, and it still worked great! When I was a much younger person I attended some art classes at my local country hall. I attended for several weeks and was pretty chuffed with some of the drawings I’d done. I really attempted to do as much detail as possible to achieve a realistic representation of the subject. One morning the teacher was passing judgment on each of our works, he was very complimentary to everyone else, offering suggestions etc and when he came to me his comment was “ you’re wasting your time in this class, if you want to depict subjects realistically you should take up photography”. His comment really shattered me. I think your work is amazing and I would be over the moon to be able to achieve work anything like you do. Oh Wendy, I really feel for you, what a silly comment from that teacher. It can be so damaging. I hope you continue to draw and paint. I might have been told to loosen up but I don’t remember it ever happening… because it would have been meaningless except to show the ignorance of the speaker. I started art classes in school as soon as they were offered -7th grade. I had the same teacher from 7th through 12th grade (she moved up with us) and was extremely fortunate to have her. She recognized my talent and knowledge and while she taught the class, I was allowed to work independently on whatever I wanted. Funny how the class just accepted it. When I reached high school my teacher invited me to her house to see her artwork. To my delight, SHE WAS A CLOSET REALIST!!!! What a hoot. Totally different story when I reached college majoring in art and minoring in biology. There the only thing that existed was ‘loose’ My art history teacher was some lala from New York where he had a studio. In any class I take I always sit front slightly to the right. One day this teacher showed a painting of a moonlit cemetery and asked each of us what was the artist thinking, why did they paint it, what was the meaning, yadda yadda yadda. Lots of ‘loose’ answers. When he came to me I said, “The artist was walking home one night, looked over and saw the moon shining on that headstone, thought it was lovely, and painted it”. Teacher went into an absolute RAGE! Screaming yelling and telling me that because I sat front middle that it was my job to make him look good – HUH? – (In hindsight I think he might have been the artist) Well, I had enough of that B and took a 3 day battery of tests to discover what career I was best suited for. They told me I didn’t need college or a degree to do what I wanted to do… so I quit. I just quit art class at a art school in Vancouver, WA. I took drawing classes for 10 months then took a summer break to go on vacation. I was back in the fall with a new teacher and she was awful mean from the start. I don’t know what I did but she said the most hurtful things to me weekly. After four months I moved to another teacher. I haven’t told the owner any of what she said or the things she said about him to me. She made me feel awful, no confidence and said I couldn’t draw (after being in a drawing class before her for an year). I told my first teacher who didn’t say anything bad about this horrible new teacher but said I could draw! Anyway I’m going to quit this school all together this month and go to another place. Watercolor painting has many ways to use the paints. Wet on wet, dry on wet, wet on dry. Anna has one way. I love her brushes and use them for oil painting. Yes, Ana. I have beeb hearing that advise. I am happy painting my own style full of detail. Lately I even have been trying change, but I do it with no pleasure. It affect the result, mess up my mind, and all I have is frustration. It is like I am not me anymore. I never realized that this is what discouraged me so much until I read this article. I was always very talented at painting, and did very well in high school, my teacher appreciated my work and allowed me to take the time I needed to complete painting, even if it meant not keeping up with the amount of work I was supposed to do, my detailed work just took longer. But when I took art in college, while my teacher praised me for my work she also said I needed to loosen up, it felt as if she was saying my work wasn’t artistic enough. She had me do abstract paintings, which I struggled greatly with. I thin that’s when I decided I just wasn’t up for being a true artist, because I wasn’t loose enough like you said. I’ve recently taken up watercolors and I find your work so beautiful, exactly what I’ve always wanted to be doing. I am really considering taking these classes, if I can find the time. Thank you for this article too! It reasures me that I can be who I am in my art, and don’t have to prove myself to anyone else. I´m with you on this Anna. I have tried to do the very loose, throw it about and hope for the best style and no doubt there are artists who can produce lovely work this way but it isnt really for me. I love painting in a detailed, botanical way and get frustrated when some people enthuse over loose paintings but are somewhat dismissive of beautiful, detailed painting. Your attention to detail and portrayal of beautiful flowers is breathtakingly lovely. I´m far to old to have your excuse of pregnancy hormones but not too old to know a true artist when I see one – and you are definately it! Very best wishes for the upcoming birth and thank you for sharing your skills with me. “painterly style” that has been the accusation thrown at me, but said in a sneering tone so I gather that my style was not the preferred style of the teacher saying I was using a painterly style. But when I looked up “painterly” it implied an “expressive” style what ever that means. In truth the teacher preferred her students to stick to a very loose abstract style so that the picture looked nothing like the object we were supposed to be painting. I preferred to put in the detail I saw. She wanted up to do big bold strokes but ignore the minute details of whatever still life (flowers, petals, stamens, seeds) or fruit or leaves or vegetables) we were supposed to be painting. But there should be no rule that demands that everyone stick to one style. I do love Anna Mason’s style. It is gorgeous. If I had a choice of an Anna Mason painting of poppies or an abstract impression painting of poppies I would choose the Anna Mason one every time. Oh Anna, you’ve made my day, I did your classes and did all the paintings from your book a few years ago and have loved working in detail since. I’ve been told just lately at painting group to lighten up seems to be the in phrase at the moment. I’ve decided that I like the way I paint and think it’s quite rude to try and change. Never heard anyone say tighten up to their fellow artists. Well said Anna. Hello Anna! So timely that you would write something about receiving comments about “loosening up” in painting. I started painting more seriously when I came across your tutorials and those of SAA and Art Tutor. As a beginner, I derived inspiration from you and others from the mentioned turorials. I was so inclined to doing details and enjoyed it. However when I started taking formal lessons, I was beginning to get comments about loosening up which made me feel terrible because the remarks were made in such a way that made detailed painting feel like a “disease!” It is funny because my teacher started as a very detailed painter (painting each grain of rice with such detail) so I was hoping that my predisposition to detailed painting would receive some notice and encouragement. That was why not too long ago, i wrote you asking if it is possible to be good in both detailed and loose painting or if one has to make a choice in either one because never the twain shall meet! What I do now is I try to go loose painting in class and do detailed painting at home when I do work to be given as gifts. I am hoping that doing so will not stunt my growth as an aspiring watercolor painter. I want to learn as much because I am turning 60 this year. I want to be able to paint as much and be very good at it. Thanks so much for this post. It is SO good to know that you are not alone, You hear the words “:loosen up” so many times you feel as if you are hitting your head against a brick wall. Whilst I do love “loose” paintings, they are definitely not what I want to do! Silly me…I was not done with my comments. How could I have sent it without saying a big THANK YOU ANNA MASON for inspiring me to paint and to celebrate detailed painting!!! Ditto here in Texas. I don’t paint with others anymore because of the loosen up brigade being alive and well where I live in the U. S. I’ve painted for more than 45 years, and still other artists need to advise my style. What irks me is these same folks are appalled if I respond they need to tighten up… I tried loosening up once and still created a detailed work, it’s natural for me. Like everyone else, I am grateful for the time I’ve spent here and the skills I’ve gained. It seems that good teaching is natural for you. Thank goodness! I have the other problem. I paint quickly, use lots of paper and often have to supplement resources offered in class with my own because I know there will not be enough for my style. I’ve been told to slow down, to concentrate on one thing only, and even, on one memorable occasion to “leave the painting alone, and sit in the corner to contemplate your errors”… if I wasn’t old enough to stand up for myself, that alone would have crushed me. It nearly did. As a teenager, I was told that I would never be able to paint because I don’t see tonal contrast very well. I have no idea if this is so, but it stopped me even attempting painting anything for probably 20 years. My detail comes in ink sketching, and is a completely different process for me. Which make me wonder is I am really an artist. Which is a whole other question! Focus on doing what lights you up and gives you enjoyment Jo. That’s the important thing! expressing one’s feelings. Realistic art comes from an entirely different perspective-one that got started in the Renaissance. there is another thing we have to remember is that botanical art is about painting the reality of a plant, not our feelings. Thank you for this post. I agree that continuously hearing that you NEED TO loosen up can discourage young artists. It certainly did it for me, especially when I was learning to paint with watercolors. I was very happy with my detailed, controlled coloring and I found it very frustrating when I was told to loosen up. I dreaded when the art teacher took the brush and painted over my stubbornly careful work in a way that was supposed to be more “artsy”. Now, as an adult, I have to say that I have come to understand that painting loosely is a good exercise to push your creative boundaries, especially if you tend to lean towards a more detailed style. But it’s not indispensable to be a good artist. It depends on what you want to convey with your art. As a scientific illustrator, I have to be very precise with detail, but I understand that it’s not everyone’s choice. I think both styles should be encouraged and explored while learning. Love, love, LOVE your style of painting, and it’s one which I emulate. Who doesn’t want to create beautiful, detailed works of art? How rewarding is it to have produced something that is a joy to behold? These detailed works really show the skill of the painter. Some of the ‘loose’ stuff is interesting to look at but a lot of it looks like it could be done in a kindergarten. This has really sparked a lively discussion! I cannot remember ever being asked to “loosen up” whilst I was taught art up to the age of 18 or at teaching college where art was one of my subjects. However, perhaps if I had gone to art school at that time ( late 70s) I may well have been asked to get more expressive or to conceptualise my work. As it was, at college I used realism to depict pop art style subjects and the tutors preferred realism to be reserved for gritty scenes of industry or warts and all portraits. The term “gesture” has been cited here as a better description for looser work and I suppose we could also talk about “broad strokes”. In art there is expressing and then selecting materials and determining how we use them to produce the piece that gives life to our expression. And whether we are honing in on detail with a small sable brush or being bold with a large brush held at arm’s length, it is our choice. And it’s all valid. No art teacher should make any individual’s approach less valid than anyone else’s and not be swayed by current trends or by “what sells”. In my opinion, great masters confound the detailed realism vs gestural expression debate. Look at Sergeant, Sorrolla, Rembrandt or Velasquez for wonderful detail rendered with a few masterful strokes…. To me, loose means a daub, ie cannot paint accurately! Dear Anna, One of the reasons i embarked onto the water color journey is you. I’m so impressed by your style. I also appreciate details. It’s what i see and it’s what i want to duplicate in my painting. I’m relatively new at this, not quite one year now. The first class i purchased was your single rose. Being in the midst of a burn out it took about 3 years before i tackle it. I had everything bought and ready. When i finally sat down to tackle this painting,i was so pleased with the results. That’s all down to you. You are a good teacher. I always sing your praises, you are my favorite artist. I have also looked at many videos of the loose style which is what water color is a natural media for such expressions. I admire the results but it’s not what i’m drawn to. I’m now a new member of a couple of art societies. They are impressed by the detail which is something they are not use to. 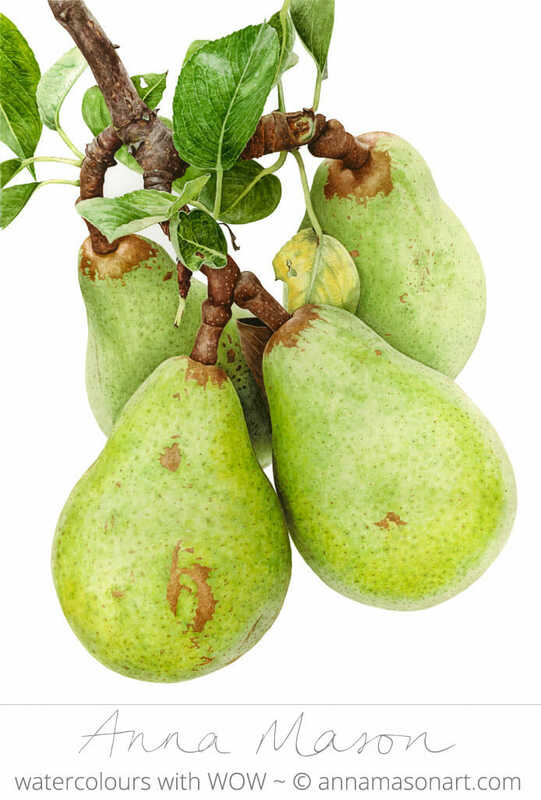 I sing your praises and direct them to check out your site and try your free tutorial on painting a pear. I did this one, my husband was so impressed by the realism. Like you i don’t think there is a right and a wrong way. I just love painting realism and it has brought be back to life. Thank you for sharing your gift. How true. Unfortunately most teachers want you to develop your own style. However, by that they mean it is only okay if it reflects theirs. Both style should be taught and the student then chooses which is best for them. There is a place for realistic rendering and much as what I feel is emotive rendering. Keep up the great work and best of luck with the new addition. Hi, when I was young. 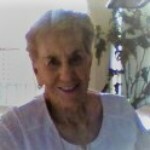 first started to paint 60 years ago I was told to paint more Painterly”, Now at 82. I paint but still do not know What’s Painterly ? 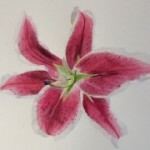 Hiya, My response to loosen up was to take an two year Botanical Watercolour Diploma, with I passed with distinction. That’s as loose as I get!!! Oh my! Anna, you hit the nail on the head with this post. I’ve worked my whole life in professions that totally consumed my life leaving me little energy to be creative. My plan was to learn watercolor once I retired. Now that I have reached retirement I have done just that. I’ve found my style to be more realistic than “loose”. My mother is an accomplished artist who, when she saw my watercolor paintings, said, on numerous occasions, the dreaded words “loosen up” and “if you wanted realism, you should take a picture”. That hurt more than I can say. I’ve also suffered the same comments from a teacher. I’ve tried to loosen up and have found no joy in that style of painting not that I don’t enjoy other’s paintings who paint loose. There are so many ways to express one’s self. I appreciate your permission to paint in the style that brings a person joy. The world is a much more interesting place to live when we embrace the uniqueness in each of us. Thanks for that Anna. I have not been told to my face to ‘loosen up’ but comments have been made that people enjoy the looser style. I have told myself that I need to loosen up and have been practising different styles but, like you, I much prefer to paint detailed work. To me it is far harder and needs a greater degree of skill to do a ‘photographic’ image in watercolour than it does to just splash some paint around a piece of paper. I join my thanks to all the others who have replied – I shall from now on continue to do detailed work and be proud of it whatever other people think. I have been told this all too often. 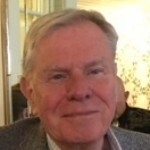 But recently I have found a tutor, Vaughan Warren RAS, who actually told me to use smaller brushes for my oil painting! He said that I should try to marry up my different styles, so that my oil painting work reflected my love of botanical watercolor. I have been struggling with learning to watercolor because of the constant barrage of teachers/YouTubers preaching the “loose” style of painting. I’ve done a lot of other types of “coloring” (i.e. some acrylic painting, alcohol ink markers, colored pencils and blending, which I love! ), but watercolor has always been something that has eluded me. I absolutely love what you are able to do!! It makes so much more sense to me. Those of us who prefer the more realistic approach so appreciate hearing that it’s actually okay! Thanks for giving us this arena to hear your thoughts and also to encourage each other! Exactly! I almost gave up on watercolor because I thought the only way to paint watercolor was the way I was taught by a particular teacher. You had splash colors across the page, loose brush strokes, etc… This method practically gave me anxiety! 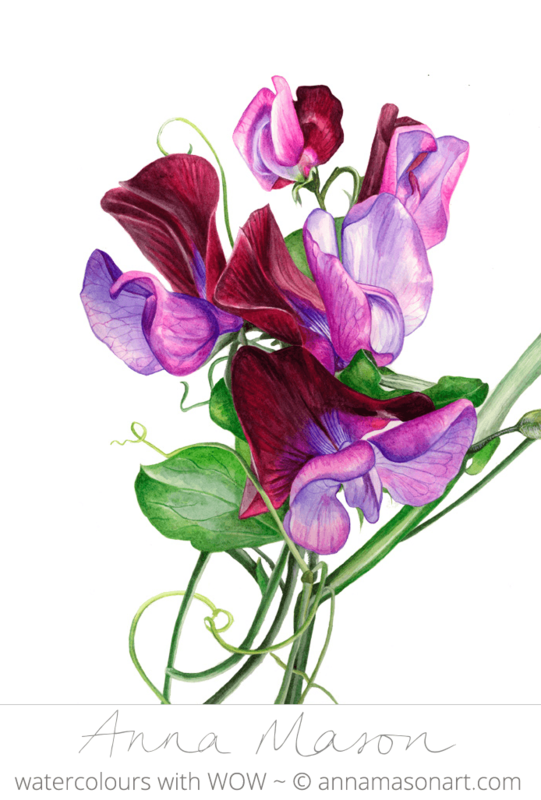 It was only when I found Botanical Art that I felt like I found my true style. I LOVE detail! I love to draw it and I love to paint it. It is so soothing to me. I am old enough now where I don’t care how others do things, I know what both makes me feel great and works for my particular artistic talents. We need to encourage eachother and the children of the world to find their own style and be okay with it. Thank you for bringing this subject up. It really helps to know others have had the same reaction! I really admire your work and proliferation! Thank you for such a beautiful website and meaningful blog content. thanks for your lovely comment Lianne and I’m glad you are doing what YOU love now. Thanks for saying it’s okay to like the details! Yes, my art teachers have said “loosen up”, but my style is to keep a lot of the details, although I do appreciate artists who are loose. I am going to stick with what I know best! I joined to tighten up 🙂 Who wants to be loose messy and nothing in the right spot !!!!!! Hi Anna! Thank you for your post. It’s great that you decided to speak about it, and I’m glad to see that I’m not the only one who suffered from all these “loosen up” advices. When I was a teenager, I attended an art class too, hoping that the teacher would help me improve my skills, especially in watercolor. I was wrong. My teacher didn’t even want to take me, stating that I was “too old” (I was 13). After our lessons I was so disappointed that I stopped using watercolor at all! I changed my mind only after watching your videos on Youtube a few years ago. Your technique helped me see the beauty of watercolor and gave me some confidence to use it again. Thank you for this inspiration! It helped me a lot. When I was just getting started sketching, I didn’t know about form and tones. I was using colored pencils and everything looked flat! I found a teacher who told me to use only graphite until I got a grasp of form and values. When I told me online art group that is what I was going to do, the moans and groans could almost be heard through the web site! After spending almost a year in graphite, I gingerly went back to colored pencils. The difference was amazing! While my online group continued posting watercolor blobs with a few details, my sketches jumped off the page with vibrancy and detail theirs would never attain. I’m so grateful for my teacher and her attention to detail and patient coaching! Thank you for your encouragement to those of us who love the more accurate and detailed style. The same comments may be applied to literature and to music performance which also require good groundwork technique. Then if pursued for enjoyment the artist/writer/musician should continue in the way which gives him/her the most satisfaction. I too was told in a class to loosen up- and that I HAD to paint a background. A fellow class member noticed my discouragement and recommended that I look at all the art hanging in my home – and THAT will tell me what I love. So I did: and all were detailed botanicals and still lifes (with no backgrounds)! In that class I continued to paint in detail and with no background: guess what? I entered it in a show and won a prize! Thank you for your wonderful tutorials and support. Art History is full of detail. I can really relate with your story. I had an eccentric drug using art teacher who only liked modern art and would only let us use wax crayons for three years. I dropped out of art as soon as I could. Luckily a friend dragged me to one of her painting classes after I’d done nothing for 20 odd years and I an enjoying creativity again. I like your more controlled style of water color painting and think you have managed to create a small revolution in teaching so many people a subject many often thought as very difficult and you made it simple. Thank you. I love detail painting. It“relaxes me. A cup of coffee relaxes me. I had a conversation with an art school graduate who told me that real artists always draw with charcoal and he chuckled at my silly pencil drawing habit. I was irritated but I didn’t take it seriously. I have nothing against charcoal, but I don’t require his approval to draw with pencils. Same with painting. If I like detailed realism for my own work and someone else prefers a loose style, that’s great. I admire many styles of painting. But I don’t enjoy hearing that loosening up is something I have to do. I belonged to a exclusive paint group( but not now) and many of the members told me that I paint too tight and that I needed to loosen up and let my colours flow. However, I like detail and enjoy doing botanical pictures. I admire your style very much. So I was so happy with your article. I was drawn to your work because of your style. I believe that one should express their message in a manner they prefer to use. I paint plants and places (in pastel, watercolor, & colored pencil) which prefer to paint as realistically as possible so yes, I’ve received similar comments. The way those comments were communicated to me felt like “You’re too uptight when you paint.” So, I truly resonated with your note! I don’t believe those providing comments intend for their message to be taken in a negative manner thought it sure feels that way. I was fortunate to receive that same critique (from an internationally known professional) in a more positive manner … He said, your work is very good and suggested that I might soften the edges so I don’t lose my style but “loosen the painting” in a sense. That made me feel good and want to get back to the easel and try to incorporate this feedback! Wishing you all the best on the birth of your child! We just need to paint to be who we are weather it be loose or tight… just enjoy and do your thing. No need to judge others as it serves no purpose except potentially making someone feel bad about their work. Why would we want to do that? 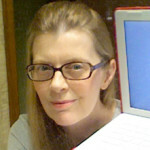 Hi Anna, i love your work, its amazing. I went to art college and then on to uni as a mature student and was told at my interview, my work that i was so very proud of wasnt art ! “‘you might as well take a photo'” they announced. Loosening up was the agreement, or else i wouldn’t be accepted. Quite right Sharon! Glad you made it back! Hahaha! It seems that many people completely agree and many have told us to relax! I do not think that they are hormones, but the desire that our individuality be respected … However I have to confess that not only others have told me that, I often find myself telling myself that I should be less meticulous and more free … Hahaha! The truth is that I really love both styles and I think that if one is able to learn from both they will still be unique paintings and with a very personal style, which is what, both for me and for others, we like. Jajaja Vaya! Parece que muchas personas estamos completamente de acuerdo y a muchos nos han dicho que nos relajemos! No creo que sean hormonas, sino el deseo de que sea respetada nuestra individualidad… Sin embargo tengo que confesar que no solo los demás me han dicho eso, a menudo me encuentro yo diciéndome a mí misma que debería ser menos minuciosa y más libre… Jajaja! :s La verdad verdad es que realmente me encantan ambos estilos y creo que si uno es capaz de aprender de ambos igual seguirán siendo pinturas únicas y con un estilo muy personal, que es lo que, tanto a mi, como a los demás, nos gusta. First, just let me congratulate you on your pregnancy. As you get closer to the big day, I truly hope that everything goes well with you, and and you have that wonderful child to cherish and to introduce into the art world. I found your web site on the internet a while ago, and worked on the pear you posted for us to try. I was so impressed that I could command this realism with your tutorial, that I now work on a painting each week. I am 77 years old, and art class at school was my fav0urite subject. However, the art teacher was a sadist who just loved to cane at least two boys during his lessons. It didn’t matter if you were guilty (some of the lads were disruptive) if you were in the vicinity, you were guilty. WACK! The problem for me was that I’m colour blind, so you can see that this presented a problem. I’m don’t hold a grudge or feel sorry for my self, but for all the years since, I kept to drawing, though of and on. Last year my wife paid for some water colour art lessons with a local artist who runs classes. I still have a problem with colour of course, but I have made progress, and I’m enjoying what I do. You may be wondering at this time how this relates to your blog about loosen up. Well only that the art teacher we have at our classes accepts that there are many styles, and encourages us to use whatever style we wish. He does show us how to put paint on paper, in all kind of styles, then to work our own way. Because of this I have developed a real love for painting and will join your classes as soon as I feel confident to undertake your fabulous lessons. Thanks for your comment Peter, wow, I’m so pleased teachers can’t use canes anymore! And very pleased you’ve found a style that you really enjoy. I hope to ‘see’ you in my online school soon! Hi Anna, I am so inspired by your videos! I’ve always preferred drawing detail and have never been comfortable with loose work. Earlier in the year I had won third place at the National Schools Art Exhibition for drawing my dad’s slippers in graphite – a very detailed careful study. My prize? A book about collage – yuk! Anyway, I have always put off trying water colour painting because of the loose way the paint was always applied, in my observations, and dabbing wet into wet and whatnot. I was thrilled to come across your careful and detailed style of painting, as well as I love botanical art, so now I am going to give water colours a try. Thanks Sarah, I hope you enjoy painting some detailed watercolours! I was actually told to put on a blind fold, stand naked in front of a canvas and ‘just let go’!! NOT ME! I am just so relaxed when concentrating on all those lovely details. All my stressing and worries dissappear. Thanks as always for your tips and insights. Thank you Anna. I love painting small and detailed and have been told that I must “loosen up” and “let it flow more”. I’m so glad you sent this email. It has made me realize that I don’t have to paint any other way than the way I enjoy. Maybe now I’ll get back into painting and enjoying it again. Hi Anna, mercifully I have not (yet) encountered this problem personally, but our daughter did when she decided to enrol for a ‘Fine Art’ degree (speech marks mine!) She is a talented portrait artist who produces almost photographic accuracy… and we warned her what she woukd be up against! In the end she was almost destroyed by the reactions to her work. She left, actually due to ongoing illness, in her second year. You may recall a TV programme featured a few years back entitled ‘Whatever happened to beauty? I was moved by the interview with a classical sculptor who said students used to come to him under cover to learn what they really wanted to learn, rather than what was being expected of them! Our daughter would be of the opinion actually that she was not ‘taught’ anything during her course, which is not only sad but horrendously expensive! So be encouraged, you are imparting precious skills to people who are being thrilled to learn them! That when I FINALLY heard it from an artist who said it was OK to paint tight and detailed I was FREE! Some paint loose and some tight. It’s ALL ok. No one is right or wrong. It’s ART! Enjoy painting the way YOU paint. Paint loose in the class if you have to and then go home and FIX it. Haha! If the instructor says you are wrong ask yourself why you are in that class in the first place? Closed minds in art? So silly. Thanks for the rant. Loved it. I don’t really like this term either. For what ever your style of painting I think that what we really want to be is relaxed not loose when we are painting. If I was loose the brush might fall out of my hand lol. When we feel relaxed and confident in our work then it shows on the paper. We blend better, our brush strokes are softer and we enjoy the experience more. I was in a workshop this weekend and I felt a bit nervous the first and second day but by the third day I felt more confident in what I had learned and my painting of the polar bear on the third day showed it. I am really happy with how it turned out.